YELL and SFU Beedie will work together to develop a new model to give credit to any student in BC who completes the YELL program, to determine how this might be done. YELL currently offers entrepreneurship training to students in over 60 high schools in Metro Vancouver and Norther BC, and has 750 graduates. The program offers hands-on training for students to develop their experience of business and entrepreneurship. “This agreement allows us to give an edge to all of our students, not just those within Metro Vancouver, but also to those students in northern and rural BC taking the exact same program,” says David Cameron, Executive Director of YELL Canada. “We hope this ground-breaking agreement helps legitimize the importance of entrepreneurial learning to high school students. SFU Beedie offers a variety of entrepreneurship focused courses through the Charles Chang Institute for Entrepreneurship, with specialist programs available to both undergraduate and graduate students. “Increasingly, it’s hard to predict what technology will enable and what jobs will be available in the future,” says Sarah Lubik, SFU’s Director of Entrepreneurship. “But what we can predict is fast-paced change, complex problems and the value of the people that can keep up, collaborate, tolerate ambiguity and problem-solve: the entrepreneurs. YELL was co-founded by SFU alumni Amit Sandhu (SFU BBA) and Punit Dhillon (SFU BA, Bus Minor) alongside Rattan Bagga, and the partnership is the latest collaboration between the two organizations. 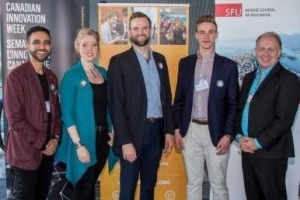 Participants in the YELL program recently presented their innovations at the SFU Beedie’s successful Opportunity Festival event, alongside leading student entrepreneurs at the university. YELL’s founders were also presented with the Community Impact Award at the Business Administration Student Society (BASS) Celebration Gala, in recognition of their contribution to the community. Please click here to view the original PDF article.